Ok, that’s too bad a definition I tried to portray in the above paragraph, Podcast is a series of audio or video digital media files which is distributed over the Internet by syndicated download, through Web feeds, to portable media players and personal computers. Though the same content may also be made available by direct download or streaming, a podcast is distinguished from most other digital media formats by its ability to be syndicated, subscribed to, and downloaded automatically when new content is added. - If you read it at Wikipedia here. 1. Lullabot :- Jeff Robins one of the vibrant and jolly podcast hosts I’ve ever listened to. 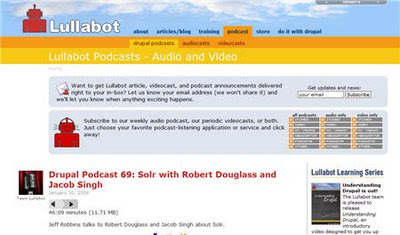 Lullabot has now reached the 69th Podcast find all of them here. Jeff Robins and the bots at Lullabot really put up a great show(podcast) every time they get their hands to the mic or the Skype phone :-). The interview with who’s who of Drupal from Dries to Earl Miles(Man behind views and Panels and other modules too) are great to listen to. So make use of you broadband and download all the healthy Drupal dose from Lullabot. 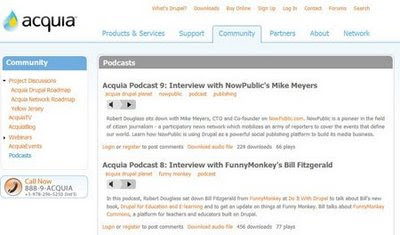 2.Acquia :- Acquia is a company co-founded by Drupal Project Lead Dries, they provide “Commercially Supported Drupal.” Hosted by Robert Douglass, this Drupal Podcast series mainly has interview with all the Drupal Ninjas we hear about. You can get the podcast here. Acquia has othere very good resources including the Acquia Drupal Distro. Now they have reached their 10th Podcast. 3.Volacci :- is a SEO company and they have done a great deal in maiking Drupal more SEO friendly. The SEO Checklisk module is a great tool to know your marks when it comes to know how SEF your Drupal site is, get the module here. It is available for both Drupal 5 and 6 now. 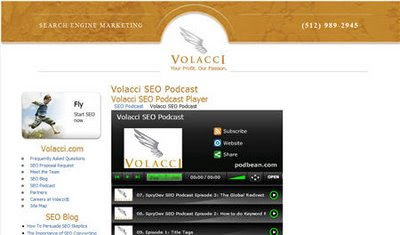 About the podcast, it is hosted by Ben Finklea the head of Volacci. He also has a good way of presenting and taken tips from the Podcast Master himsef Jeff Robins of Lullabot. If you want to know more about general SEO and Drupal SEO don’t miss this podcast here. 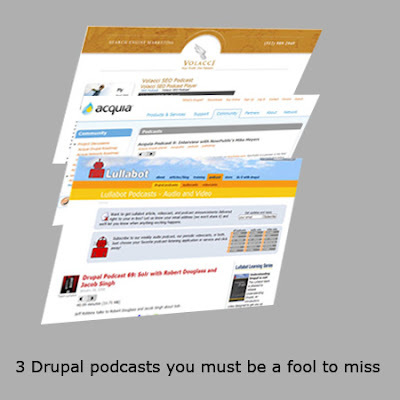 Have a great time listening to the Podcasts, may you know more about Drupal and Drupal SEO. Downoad them and subscribe to them to get the latest. Happy Listening.